The second principle of the science of painting is the shadow of bodies. 1. The beginning. “Rise to fame”. Year 2001. In Baku the exhibition “Orientalism – Inside & Outside” was held at which numerous works by young, budding authors were displayed. This is a significant exhibition for the republic – a demonstration of the possibilities of a new generation stepping on to the contemporary art scene of Azerbaijan at the start of the 2000s. Amongst the large number of bright, impressive works there was one small and at first glance rather unimpressive installation by Rashad Alakbarov titled “East-West”. Deliberately placed in a corner the work was based on the play of shadows. On a low table in the particular manner for which he is known the artist scattered numerous unconnected household items creating an impression of randomness and chaos. But they had been placed in such a way that the light falling on them from both sides, when alternately switched on and off, formed totally familiar shadows on the walls (that is why the work was positioned in the corner in order to make use of both walls): on one wall we could see shadows evoking associations with New York (skyscrapers), on the other wall were shadows associated with a Muslim country (mosques). When recalling that year and particularly the events of 9/11 that happened right at the turn of the millennium then Alakbarov’s work was fully in tune with the actual thematic context of those days. But by no means was this the reason his work made such an impression. Professionals and experts showed interest and the artist’s stylistic approach itself was stunning, combining a subtle virtuosity, desire for innovation, visual merit and the rudiments of almost an engineer’s way of thinking that would become more developed in the future. It was clear that the originality of the installation was not at all founded on the theme – the subject matter and content could come from anywhere, which was confirmed by the artist’s subsequent works – but was based on the discovered “know-how”, an unconventional methodical technique. Even the use later in installations, not of ornamental elements but of words and phrases (“Crisis, Ha Ha” 2009, “Try to save” 2013) – a sort of acknowledgement towards conceptual art – does not alter the heart of the matter. Precisely for this reason I shall be analysing below not so much individual works as the conceptual nucleus common to all these works… Returning to that exhibition, I can only say it was there, and what had become clear to the most insightful connoisseurs of visual arts – that a new, bright artist had appeared on the Azerbaijanian contemporary art scene with his own recognizable creative “style”. True, the artist’s creations would also include works along other lines – more traditional sculptures (“Beauty and horror” series, 2012, Painting on plastic gazelle in frames of “Qiz qalasi” festival, Baku, 2012), even pictorial art (Diptych “Women, weapon, colour”, 2011), but nevertheless the trademark and central core of his work at the present day have been and remain spatial light-and-shade installations. The first shadow installation was still very simple, necessarily minimalistic, in some sense even trashy. Later he would complicate the sculptural architectonics of his compositions, variegate the colour scheme, attach delicacy and visual elegance, but the principle itself would remain the same, it had already been discovered in that very first and to a certain degree sensational work that brought instant fame in the local art community where nobody was any longer doing such work. Not by accident did foreign curators willingly display this work in their artistic projects. It has to be said R. Alakbarov’s professional career is more than impressive – from small but important curatorial exhibitions (2005 - "Utopia", Berlin, Germany, 2008 - "Art is not only ugly", Azerbaijan cultural days in Berlin, Germany...) to large, landmark cultural events where participation enhances the rating and image strategy of the author (2007 - "OMNIA MEA", 52 Venice Biennale, Azerbaijan Pavilion, Venice, Italy, 2012 - "Fly to Baku" - Contemporary Art from Azerbaijan, Philips de Pury & Company, London, United Kingdom). For the sake of objectivity, we point out that at the present day R. Alakbarov is not the only artist working with shadows. In the art world a whole shadow art movement has already developed, uniting a considerable number of international artists with the given stylistic direction. These are just a few of the most popular names: the Greek artist Diet Wiegman, the Japanese female artist Kumi Yamashita, the British contemporary arts duet of Tim Noble & Sue Webster, the Japanese artist and graphic designer Shigeo Fukuda, who incidentally began experimenting with shadows as early as the 1970s of the last century and many other original artists1. In contemporary art from the very beginning up to the present day two poles have peacefully coexisted – the pole of technology and the pole of antiquity. Often the development of contemporary art is associated with the dynamics of technological progress. Indeed, avant-garde artists were the first to enthusiastically embrace to the scientific and technological revolution with its unpredictable possibilities that seemed almost magical to the ordinary mind. Discoveries in the exact sciences and the stream of technical inventions became a source of inspiration for many involved in the arts and even for whole movements, for example, Italian futurism particularly its ideologue F.Marinetti with his crazy admiration for the poetics of steel constructions, machines and speed. Thereafter, the union of avant-garde art and the spheres of innovative technologies only got stronger. The dawning of the digital age increased incredibly the effect of the constantly regenerating technosphere in the realm of contemporary art, the most relevant forms of which were electronic digital media – photo, video, computer and cellular technologies. This is an obvious and undoubtable fact. Let us attempt to examine the semantic field in which the creative works of our artist are inscribed and answer the question why it belongs to the pole of antiquity and where lies the strength of this pole which is in no way inferior to the explosive potencies in the anthropogenic sphere. Above we noted a circle of artists who are close to him in their methodology and approaches. Now we will describe the more general conceptual and historic context incorporating not only contemporary art. But let us start from simple things – definitions of how generally to designate what R. Alakbarov does. What is it and what is it similar to? Looking at the author’s installations, we notice they all have a uniform and invariable visual structure. They consist of three components: a light source, the object through which the light beam passes and the shadow cast by this object (falling) on to the wall. It could be described this way: You could say that the mystery of the static theatre of shadows is created with the aid of directed light, darkness and the surface of a wall screen. In addition the spatial arrangement takes the following form: the object (almost always abstract) is positioned in the middle of the composition – it may be on the floor or can be hung from the ceiling – in front of it at a strictly defined point the artist places the light source and finally the light beam “embracing” this object creates a shadow composition on the wall behind the object. 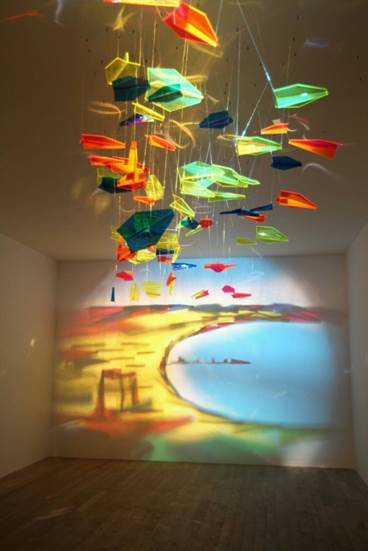 Thus, this trend can also be called shadow art as it is often termed and light art or the art of light and shade. Considering the element of light dynamics and the actions of the artist as a channelling shaman, I could also describe these works as perforated sculptures. One way or the other, the main element here is the shadow being cast because it is namely it, being the result of carefully calculated light manipulations, that forms the resulting image on the wall. As we can see, the principle is simple, - projection on to a wall – but by virtue of the archetypical power and secrecy of the relationship between light and shade it helps to hold our attention at the required level of tension and concentration. But what is shade? According to Leonardo da Vinci: “The first picture consisted of one single line surrounding the shadow of a body, by means of which it is represented”2. Thus, it can be proposed that the shadow was the world’s first Image, the first Picture. It means all remaining shadows hark back to this first Image as it archetype, similarly to the way every person genetically dates back to the primal man, Adam. As to the historical nature of this theme, then the tradition of shadow images can trace its beginnings to very ancient, primeval times. One can easily imagine how our distant ancestors, living in a cave, would immerse themselves in a meditative state, beholding the play of shadows on the underground stone vaults, indeed the sole source of light would be the fire lit in the cave. The shadows cast by the people and items were bound to fascinate and stir the soul of primitive man – the dynamic tongues of flame would turn these shadows into vibrant silhouette images. Due to the space of the cave being immersed in semi-darkness, the aura created by the appearance of a shadow image was permeated by a mysteriousness that released the imagination and fully corresponded to their trance-like view of life. 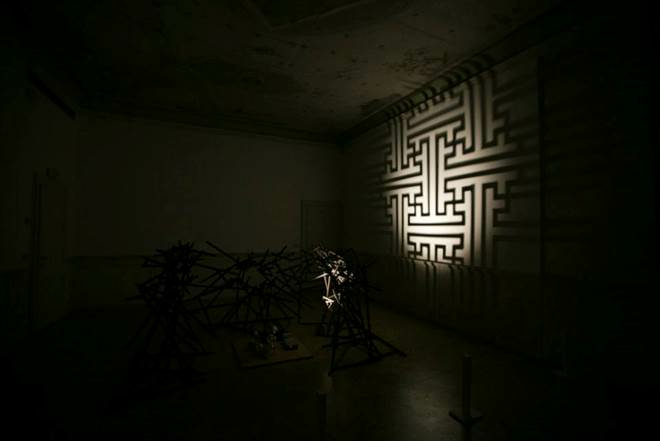 So, the genealogy of the creative path of R. Alakbarov is obvious to us – this is the line of force of trance-like, ritual shadow presentations where the shadow acts as the archetype of any image and by its conventional, emblematic nature has been endowed with magical powers of suggestive influence on people, mainly on the unconscious. R. Alakbarov’s installations have one notable feature that constitutes the main suspense contained within his artistic endeavour. This suspense is based on the relationship between the plastic pattern of the object and the outline of the shadow cast by this object. Normally, the shadow cast by an object is similar to the object itself, it resembles an imprint of this object and duplicates its silhouette. 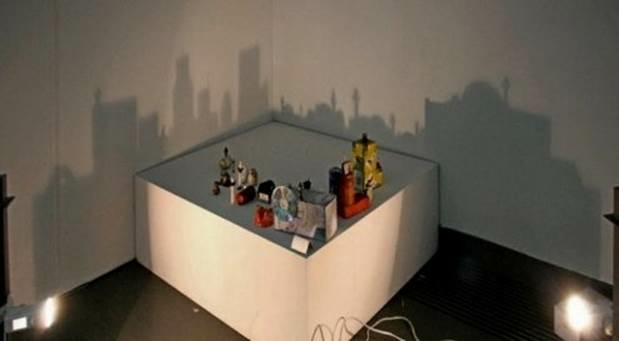 We can say the shadow from a cube will be square, from a cylinder it will be rectangular, from a sphere round, so the shadow of a person will duplicate the silhouette of his shape and without seeing the person himself we can understand that this is namely the shadow of a person and not of something else. That is, there exists a subtle “genetic” connection, a corresponding relationship between the subject and his shadow (like a two-dimensional projection on the surface from a three-dimensional form of this subject). This corresponding relationship can be termed the graphic equivalence between the subject and his shadow projection. Now we can look at the majority of R. Alakbarov’s installations and see whether or not this relationship has been maintained. Where it has not been maintained the artist is boldly and consciously violating the principle of graphic equivalence! Thereby, he creates an optical paradox designed to generate a shock effect on the viewer. Here lies the tension! In the artist’s works the object illuminated by a ray of light often displays a chaotic structure which we can hardly identify with any easily defined complete entity. Yes, of course, the objects included in the space of the installation are easily identifiable, but any interconnection between them appears purely random if not absurd. It could be an agglomeration of wooden poles placed in various positions, a bizarre and completely illogical tangle of iron rods or industrial and household pipes. There could be a group of carelessly scattered items, boxes, fruits, all sorts of knick-knacks, yes, practically anything could be there including an object having an aesthetically finished form… But, in any case, the shadow from all this creative, at times trashy disorder is far from chaotic. 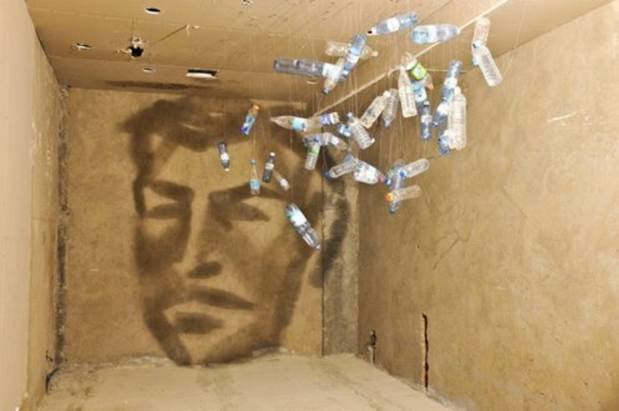 On the contrary, this is a clearly and precisely “draughted” shadow image, be it a symmetrical ornamental composition (“East” shadow installation, 2011), or a figurative almost realistic outline of a person (Portrait made of bottles, 2011), or even a picturesque landscape shimmering with gentle, pastel colours (Fly to Baku, 2011). In other words, the chaotic formless structure casts an uncorresponding shadow on the wall. What we have from the artist is a precisely calibrated filigree and a geometry of concrete representational forms draughted with the finest nuances, “cleverly” hidden within the abstract structure of the subject. The viewer however long he looks at the object from different angles, can scarcely fully comprehend the precise technology of the mathematical calculations. The installation becomes a conundrum, a puzzle that is extremely difficult to solve. This is where the artist’s special magic lies with its similarity to the intellectually unexplainable deeds of Indian Yogis and fakirs and to the entertaining routines of present-day magicians and illusionists demonstrating eye-catching elaborate circus tricks that seem to defy common sense. The non-conformity of the shape of the subject’s configuration to the shadow cast on the wall shows us that a full figurative image can only be obtained if we look at the object from one unique reference point. Only by interpreting from this reference point, namely from the so-called assemblage point (according to Carlos Castaneda), from where the directed light beam originates, is it possible to see how an object made up from an abstract delicate three-dimensional structure can transform itself into a beautiful and clear figurative outline. Expressing it another way, the light beam which in the given case is analogous to the gleam of human attention, arising from a central point (the eye’s location), as it were creates a world out of the randomly scattered points, spots and lines and turns Chaos into Order. Here, there are analogies with certain scientific disciplines, for example, quantum physics, phenomenology and gestalt psychology. Thus, in quantum physics, unlike classical science, the position of the observer has begun to be studied. If the physics of the Newtonian-Cartesian model of the world studied the universe in isolation from the person studying it (consciousness of the research scientist), then quantum physics introduced a most important concept in the anthropic principle which takes account of the observer. And not only as a passive observer on the side, but as someone actively participating in the observation process and, ultimately, creating reality by the very fact of implicating his consciousness in the observation process. The main thesis of the anthropic principle is as follows: Reality only exists when it is observed by an observer. On this subject we can quote physicists themselves: “…the whole Universe precipitates into actual existence only at the moment it is observed, until that point remaining in a virtual state (an implied universe)” (J.Wheeler)3, “It is not just a question of the fact that you cannot measure nothing. This “nothing” does not exist – until you begin to observe it” (F. Wolf)4 Moreover, the actual object exists while we are observing it (read: we create by the beam of attention), and as soon as we cease observing (creating) it vanishes… The state of the formless object in R. Alakbarov’s installations corresponds in the quantum theory to a state where there is nothing. The point from where the light emanates is the point of view of the observer, creating Reality by his beam of attention and observation (shadow outline) from nothing. The light is switched on and the image lives, when switched off the outline disappears. In phenomenology (F. Brentano, E. Husserl) there are three main notions: intentionality – the direction of attention on to the subject, the poetic act when the beam of attention forms the very notion of the “external” subject within a person’s consciousness and the noema – the very notion of this subject, formed, “moulded” by a person’s beam of attention within his subjectivity, that is, as the result of a sensory experience. Again, if we apply the present scheme to the works of R. Alakbarov, then we obtain a similar picture for the creative process: intentionality for him is the beam of light directed on to the object, the poetic act is the process of formation by the light beam of an image out of chaotic structures and finally, the noema is the finished shadow image itself on the wall. But as we indicated above, this outline is ephemeral, an illusion! So, it is interesting here to draw parallels with ideas that have already become popular concerning the relationship between genuine Reality and the visual, unreal world. In the sensational and cult film of the 1990s “Matrix” the difference was vividly shown between the world in which we live and the genuine Reality hidden from our view. When the main hero of the film by the name of Neo enters into the genuine Reality, it turns out completely different and unfamiliar for him. And the universe, inhabited by him and all the ordinary and unsuspecting people, is nothing but a beautiful decoration woven from ephemeral substance, a dream world, a day dream. But it vanishes as soon as the light is turned on. Meaning it is an illusion, transient, unreal. So here is an object that casts this shadow – it’s solid, tangible, it can be touched, its presence can be felt. So, an object that however unimposing it may have appeared can be a symbol of genuine Reality. Here we can observe an extremely interesting thing. The fact is that the artist in his spectacular installation performances, as it were, unwittingly and most likely unconsciously reveals to us the hidden mechanism of creation, inviting us into his masterful work of art, allowing us contact with a place of demiurgic mystery. This is the most interesting and least obvious moment in his work. Proceeding to the end of our presentation, let us investigate this question. Where does the main tension lie in, say, the theatre of shadows? Apparently, in the fact that we look at an image but we cannot see how it is made. The creative mechanism, it turns out, is on the other side of the screen. There behind the screen a certain spiritual mystery occurs, vital creative currents start flowing and a fantastic combinatory analysis of forces and virtual potentialities is played out. We can view the results of all this unseen work on the screen. Put another way, genuine reality with all its secrets is to be found on the other side of the screen. We have been necessarily immersed into a world of visual illusions, phantoms. For example, let’s take a carpet. On the main, upper side we behold a beautiful, decorative outline of patterns and ornamental designs. Here, everything is precise, clear and understandable. But looking at the reverse side, we see haphazard threads, a certain logical neglect and irregularity but these are precisely the hidden power behind the scenes, creating the correct image on the upper face of the carpet. To use an analogy with computer technology: on the monitor we see a beautiful website design behind which lies, let’s say, an HTML hypertext language link representing a logical combination of graphical symbols. That is, at the heart of a nice looking website lies this logical-mathematical network that is puzzling to the untrained person but without which there would be no website. Here it is notable that the heart of this network is always hidden from our view. Returning to out theme, suppose that the shadow on the wall, as a ghostly ephemeral spot is nothing more than the progeny of the object – of the “genuine Reality” – and the result of the combination of plastic elements of this object with a light beam passing through them. It performs the very same role as the heart of the network in the foregoing examples. And now, having memorised what has just been said as important information, let us switch to the main moment, for which it is essential that we recall the most important mythologem in Plato’s teachings – the myth of the cave. When referring to shadows and shadow projections we simply could not exclude this myth from our analysis.